So it's the end of the year and the warehouse workers and all the salaried employees are gathered together on a Saturday morning to perform the annual physical inventory. The coffee and donuts help to put color into the faces and cover up the odors enveloping those who had overindulged themselves the night before. People are wandering around not sure what they should be doing, when the boss walks in with stacks of reports, cards, and colored stickers and says "OK here's how this is going to work." By noon it's obvious that less than half the warehouse has been counted and the pizza lunch has left everyone with an enthusiasm deficit. At two o'clock, one by one, people start approaching the boss with the reasons as to why they have to leave. Suddenly the pressure increases on those remaining to get finished. Five o'clock and the last of the counters are abandoning ship, there's an enormous pile of paperwork marked "discrepancies" and several piles of product marked "unknown," "what's this?" and "needs to be identified." The boss surveys the scene and instructs the people in charge of investigating the overwhelming pile of discrepancies to "just make the adjustments, we need to get out of here." With some variations, this is how annual physical inventories are performed year after year. So what’s wrong with this process? Everything!!! You’ve just had a group of people with inadequate training and experience — most of them forced into being there on their day off — count your inventory, and have then made adjustments to your on-hand balances based on those counts without having the time to adequately investigate the variances. The final result likely being that half of the adjustments corrected previous inventory problems while the other half created new inventory problems on items that were correct prior to the inventory. In case it’s not obvious to you, I don’t like annual physical inventories. Counting inventories on a regular basis throughout the year (cycle counting) combined with a process for continuous improvement in inventory accuracy will prove a far better method for achieving accurate inventories. My definition of cycle counting tends to differ slightly from the generally accepted one. Most people think of cycle counting as regularly scheduled (usually daily) counting of product where you randomly count items based upon some type of predefined parameters. For example, inventory is broken down by ABC classifications and frequencies assigned such as A items counted 10 times/year, B items 5 times/year, and son on. I prefer to define cycle counting as any count program using regularly scheduled counts where you count less than the entire facility's inventory during each count. This includes a system that I’ve found to be highly effective, that is a hybrid of a physical inventory and a cycle count, where you’re counting all inventory within a physical area like a physical inventory, however, you are not counting the entire facility at one time. The next day you simply start where you left off the day before. Regularly scheduled physical inventories can be an effective way of counting inventory in smaller operations provided you are using trained counters and have adequate time to investigate the discrepancies prior to making adjustments. If your inventory is so extensive that you cannot adequately investigate the count discrepancies, you must break it down into some sort of a cycle count program. If you are running a successful and comprehensive cycle counting program, there is little benefit to performing an annual physical inventory. Unfortunately, many in the financial establishment still live in the Dark Ages when it comes to inventory counting and will try to tell you that “you must perform an annual physical”. Once again I’ll state that if you can count and adequately investigate count discrepancies in a single day, then go ahead and perform the physical. However, if your inventory is too extensive or if you are in a 24/7 operation, do not want to shut down operations, and feel confident in the accuracy of your cycle count program, you can pressure them into accepting some type of on-site audit instead. They generally don’t like it but they will do it. Your count program should be customized to your specific operation and business. Do not accept the “one system fits all” approach. In complex operations you may have a count program that uses multiple approaches to counting, such as one method for finished goods, another for WIP, another for raw materials, and still other methods based upon whether the inventory is stored in fixed or random storage areas. The first thing you need to determine is why you are counting. Specifically, what is it that you expect to achieve through your count program? If you are setting up a program just to fulfill a corporate requirement of counting inventory X times per year or to achieve some subjective accuracy number thrown at you, you will likely not end up with a highly effective count program. You should be counting to optimize your business operations and achieve high levels of customer service. 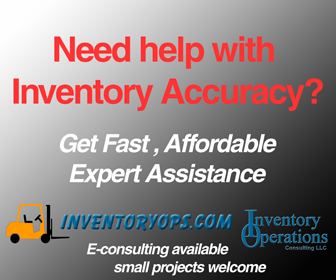 If your business has been operating for some time you probably have some idea of the areas that have had ongoing problems related to inaccurate inventories. This is a good place to start, however, you should also weigh the effects created by these inaccuracies to determine which areas are more critical than others. Small variances in some types of raw materials may have little or no effect on operations while inaccuracies on others may shut down an operation. Inaccuracies in finished goods tend to have the most obvious direct effect on customer service and generally get a high priority in count programs. Count frequency should be calculated to meet your previously stated objectives. Factors such as the effects on customer service and manufacturing operations, and the potential for inaccuracy within the specific product group will affect the frequency of your counts. Even factors such as manufacturing and supplier lead times should be considered in prioritizing counts. Certain key raw materials critical to your operation that are highly prone to variances due to high scrap factors or variation in manufacturing processes may need to be counted every week (or day) while some very slow-moving finished goods may only need to be counted once a year. As your count program evolves, the frequency of counts will change based upon the accuracy levels achieved. Your count program should be considered part of a continuous improvement process. Tracking accuracy is necessary to determine where improvement is needed. The more detail you can provide, the better you will be able to pinpoint specific areas requiring attention. Breaking down accuracy by product groups, physical area, and operational groups, will provide the information needed to improve processes and determine priorities for future counts. Don’t get hung up on “Benchmarking”. There are so many variables in the ways accuracy is tracked from one organization to another that these comparisons tend to be a waste of time. What you should get hung up on is consistency. Spend the time to develop your methods for tracking accuracy to meet current and future needs. Long-term data is invaluable provided the method used to compile it has not changed. I primarily use two methods for tracking inventory variances, which I will refer to as Transactional and On-hand methods. On-hand tracking is the most commonly used method where variance amounts are divided into on-hand amounts to give you a variance percentage. The On-hand method gives you a snapshot of what your inventory accuracy is at that specific point in time. It is helpful in projecting the impact your variances might have on subsequent operations and is the only method accountants use. The problem with the on-hand method is that it may not give you enough information to pinpoint process problems and, at a detail level, it fluctuates too much based upon current on-hand balances. For example, if on Monday you count part #XYZ and find you are short 20 units out of an on-hand balance of 100, this results in an accuracy rate of 80%. However, if you did not count this item until Tuesday and a receipt of 2000 units was received Monday afternoon, your accuracy rate would now be 99% even though you are still missing those 20 units. Transactional tracking compares the variance amount to the amount consumed during the count period, showing the accuracy of your operation. This type of tracking is far more useful in determining process problems. Unfortunately, it is also much more difficult to implement this method. In the same example where you are short the 20 units and you determined that you have consumed 1000 units during the count period, you now have an operational accuracy of 98%. If this item is a raw material used in manufacturing and you determine that your finished goods is accurate, then you may have a 2% variance either in your bill of material or scrap reporting. Transactional tracking assumes that your receipt quantities are accurate. There is another method widely used in cycle counting I will refer to as Good Count Bad Count. In this method you compare the number of good counts to the number of bad counts. Tolerances are often put in place to allow a count to be considered "good" if it is within a certain percentage. I personally find very little value to this method. Regardless of the methods used it is important to summarize variances in both net and gross amounts. For example, if you had variances on three items, one being short $50, another short $5, and another over $40, you would have a net variance amount of -$15 and a gross variance of $95. Gross accuracy calculations are a better method of showing true accuracy. In the end, the measurement must be meaningful. If the measurement is not providing information that will allow you to optimize operations, why are you doing it? Now I know I’ll get a fair amount of disagreement on my views on this subject, but here goes. First of all, a blind count occurs when you send your counters out with an item number and location, but with no quantity information. They count the product and write down the quantity or enter it directly into a data collection device. The count administrator then compares the count quantities to on-hand quantities and investigates any variances (usually conducting recounts of each variance). The problems with blind counts are that they have lower first-pass accuracy rates and are more time consuming. Just the action of writing and/or entering the counts creates an opportunity for error. Having someone perform a recount on all variances is necessary on blind counts, this puts greater demands on your resources. If you do blind counts and perform recounts of all variances, this is the most accurate method of counting inventory. However, by giving your initial counters the quantity information and setting a system to just confirm correct counts and only enter variances, you will greatly reduce initial count errors, thus reducing recounts, thus enabling you to count more product with the same amount of resources. Now don’t get me wrong, there is a downside to giving your counters the quantities. If you don’t keep tight control you may find some counters cheating on items that are difficult to count by just confirming it as correct if it looks close. You also risk honest employees unconsciously making errors just because the quantity is visible. Trust me, when you're doing a lot of counting your mind can play tricks on you, if you see a quantity of 12 on the paper you might look at a stack of 16 and think 12. If you closely monitor the count process and thoroughly train your counters, the benefits of counting more product often outweighs the risks associated with non-blind counts. Timing is critical in cycle counting. In a perfect world you should be able to count and resolve discrepancies with no other processing going on during the count process. If your operation allows you to do this, great, your job will be a lot easier. If it is cost prohibitive or impossible to shut down all other operations, it does not mean you cannot have a successful cycle counting program — it just means you're going to have to work a lot harder at it. You will need a thorough understanding of all operations and must be able to track any transactions occurring during the counts. Even with this you may have situations where it is just far too difficult to get an accurate count on an item that day and may need to skip it and count it again a couple of days later. Whether you are shutting down operations or not, you must have solid procedures and thorough control over inventory operations making sure that all transactions are performed in a timely manner. Only use highly trained accurate employees to count your product. Specialize if possible. Having employees whose primary responsibility is counting inventory and resolving discrepancies will greatly increase the level of success of the program. In some operations this may not be feasible. Understand the effects of adjustments. It is imperative the person responsible for approving and making the inventory adjustments based on your counts understands the effects of these adjustments. One of the biggest problems I see with cycle count programs is that they do not handle “lost product” well. If you have a random storage warehouse and are counting by item, your count program will tell you when you’re missing something but does nothing for locating this lost product. You will need some type of location auditing process in conjunction with this to find the “lost product” or change your program to be based on location rather than item. Meanwhile your count administrator must be making decisions on variances and determining when to make adjustments. In many operations, an adjustment is made one day to deduct the missing product and an offsetting adjustment made a few days later when it is found. The problem with this is the effect this has had on materials management. When the product was deducted, a new purchase order was probably generated to order more product and production schedules and manufacturing orders may have been changed due to the unavailability of this item. Even though the product turned up just a few days later you’ve still caused additional work, disrupted the production schedule, and may now end up with excess inventory on this item. A good count administrator should be able to determine if a variance is due to a process issue or is “lost”. Adjustments for “lost” and “found” inventory should be avoided whenever possible. Creating a variance location to move “lost" and “found” product to and from is a great way to have visibility to the variances without the havoc created by the adjustments. These variance locations must be closely monitored and you must have an aggressive program for finding the product. An aggressive location auditing process will prove to be far more effective than sending someone out to “look for the lost product”. Obviously, tightening up the processes to avoid missing product in the first place makes this less of an issue. Now I’d like to say that your count program doesn’t need to be this complicated, however, in many operations a complex count program will prove to be the most effective method of dealing with a complex inventory. A good count program combined with solid inventory practices will prove to be a significant asset to any organization. You may still have specific counting demands placed on you by outside sources such as customers and financial institutions. Demonstrating the success of your counting program and inventory practices should reduce or eliminate the need for these special inventories.